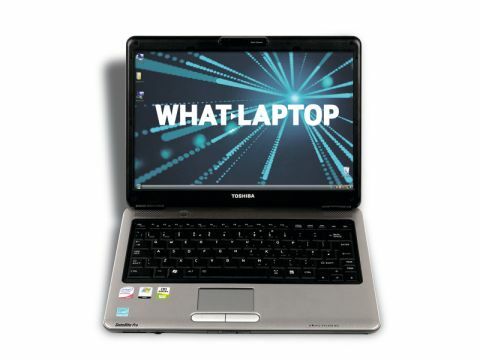 Toshiba's Satellite Pro U400-IOH (£763 inc. VAT) is an affordable, semi-portable laptop aimed ﬁrmly at the corporate user. It features a 13.3-inch screen with a Super-TFT coating, producing bright and vibrant images. It can be tricky to use in direct sunlight due to reﬂections, but it's ideal in all other conditions. The 1280 x 800-pixel resolution produces sharp images, and there's more than enough space to view two documents side by side. An integrated Intel GMA X3100 GPU deals with graphics, and gives the Toshiba a decent 3D performance. That means you'll be able to run regular applications without trouble, but you should look elsewhere if you need a powerhouse portable for editing videos or running games. Comfort on this machine isn't compromised by its small size, and the keyboard is excellent. The keys feature rounded-off edges, making it easy to type without errors, and the plastics are tactile to the touch. Only a slight ﬂex under pressure lets it down. It's an ideal machine for use on the daily commute, with robust plastics and thick hinges that hold the display ﬁrmly in place. The matt silver and black design will appeal to the business user, proving resistant to ﬁngerprints and light scuffs. A 2.1GHz Intel Core 2 Duo T8100 chip provides processing power, and proved more than able in daily use. It runs Windows Vista Basic – a stripped-down version of the OS – and limits it for business use. The inclusion of 3072MB of memory helps multiple applications to run without lag. The Toshiba lasted for just under three hours between charges. At 200GB, the hard drive offers enough storage space for most users. Other features include an integrated webcam and microphone, so you'll be able to carry out video-conferencing with ease, and a multi-format DVD rewriter lets you back up your ﬁles and applications. A comprehensive software suite includes McAfee Internet Security, and Microsoft Works. Wireless networking is restricted to 802.11a/g – rather than the faster 802.11n Wi-Fi chips found in the other laptops here, but Gigabit Ethernet provides the fastest ﬁxed connections.